Hieromartyr Saint Réginos (Greek: 'Aγιος Ρηγίνος) is the patron saint of the island of Skopelos, Greece. He was a bishop who was tortured for the faith and finally beheaded in 362 AD under the reign of the Emperor Julian the Apostate, along with forty others. 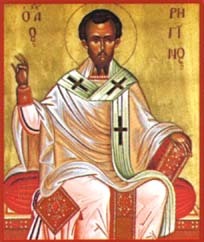 St. Réginos was born in Livadeia in central Greece, in the late third century to Christian parents, who instilled in him the love of virtue and zeal for truth. When the bishop of Skopelos passed away, Saint Réginos was acclaimed as the new bishop by all of the people. As the Arian heresy continued to rage after the Council of Nicaea (325), a new council was called at Sardica (Sofia, Bulgaria) in 343, during which St. Réginos distinguished himself by his ability to refute the heretics. His is commemorated on February 25, which is a local holiday on the island. At the Monastery of Saint Réginos, which houses the relics of the saint, thousands of faithful gather each year on February 25 from the surrounding islands of Skiathos and Alonissos as well as from the coastal port city of Volos, to pay hommage to the martyr. The saint has shown his love for his flock by performing several miracles of healing according to the locals, several of which name their children after him (Réginos or Regina). (Greek) Ὁ Ἅγιος Ρηγίνος ὁ Ἱερομάρτυρας. 25 Φεβρουαρίου. ΜΕΓΑΣ ΣΥΝΑΞΑΡΙΣΤΗΣ. (Greek) Άγιος Ρηγίνος. Greek Wikipedia. This page was last edited on February 25, 2019, at 12:47. This page has been accessed 9,560 times.